Jumping onto the bandwagon: I’ve finally tried Tom’s Palette! After my last lesson on friday, i was determined to get a taste of Tom’s Palette after receiving numerous recommendations from Jerlin. It took a lot of effort to resist desserts after lunch in cedele, they had blueberry maple that day! I took a little while to navigate around in shaw leisure gallery, because this place changed so much. There used to be a cinema there and subway, now replaced by starbucks and other shops. Tom’s Palette is tucked all the way at the back of the first floor, #01-25. I had logan red date (the brownish one) and lychee rose. Logan red date was potent stuff, overpowering the lychee rose. Strong and distinct flavours of each ingredient but yet they complement each other so well. Lychee rose could have done better with more of the rose element but from what I learnt from Jerlin, they use lychee tea(?) and infuse rose into it. SO I gather that the lychee is supposed to take centre stage and rose, just the supporting role to accentuate it. No complaints about this BUT I am biased because I love the smell of floral flavours. Now if only I didn’t impose as a personal policy that I would limit my sugar intake because 1 cup is simply insufficient! The cup felt tiny in my hands and I wanted so badly to get more but the concience was getting on me after bursting the sugar quota for the day in the morning (truffles, who can resist truffles in the morning?). 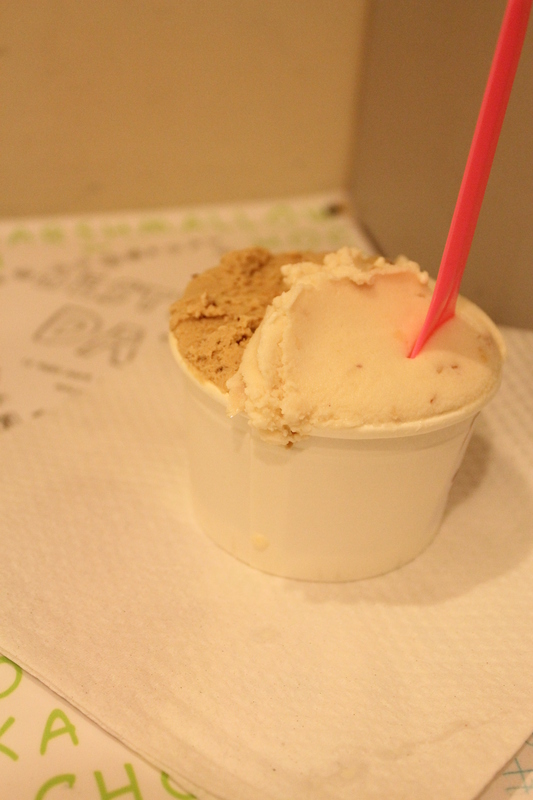 I believe the ice cream was too good so much so it felt too little, haha. And again, no complaints about the price of $2.80. 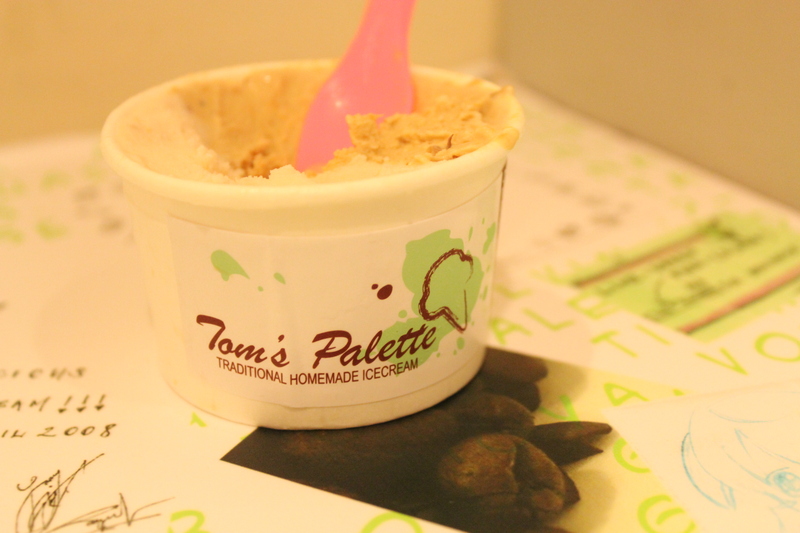 Artisan ice cream that beats those sold in restaurants selling at less than half their prices, who can complain? Now if only NUS would do the kind favour of sending a contract to Tom’s Palette so that I can secure my 10% discount (I know I’m being petty about 28 cents but still! ).